I guess I just wish they'd called yield signs something else. I don't mind taking orders from signs. I have no problem being told to stop, or go, or merge, or slow down, but whenever a sign tells me to "yield" my first reaction is to scream "I YIELD TO NO MAN!" and then charge through the intersection. Now, The Ladies, obviously, are probably number one on any guy’s list, so there’s no need to look too deeply into that. But let’s take a closer look at ninjas vs. Conan. Listen, I love ninjas and I also love Conan. I'm not going to get into who would win in a fight between Conan and a ninja, because that's like deciding which of your kids you love more. Basically, I believe if Conan and a ninja got into a fight, it would never end. It would be a battle that raged on into all eternity. What I do want to talk about is what Conan and ninjas have meant to me. I think the only reason ninjas top Conan in my thought pantheon is that I spent my ninth through twelfth years thinking exclusively and unceasingly about ninjas. This built up quite a lead in the ninjas’ favor and although I’ve been thinking about Conan a lot longer, the aggregate time advantage falls to the men in black. However, if I were to evaluate the impact Conan has had on my life in comparison to that of ninjas, I think the bronze-thewed Cimmerian wins out. My wife and I piled the fam into the car and started driving to the emergency room to see if we could get the chunk sewn back on. Unfortunately, our route was bisected by a train track that runs all the way through Madison and as we drove we got stopped THREE SEPARATE TIMES by the same freight train! Can you imagine the frustration? I’m sitting in the car, trying not to bleed to death and holding a tupperware container with half my goddamn finger in it, and I have to watch the same 400 railcars roll past me at three individual crossings! So, what did I think about during this trying time? Did I call on JC? No. My mommy? No. My loving and supportive wife? No. 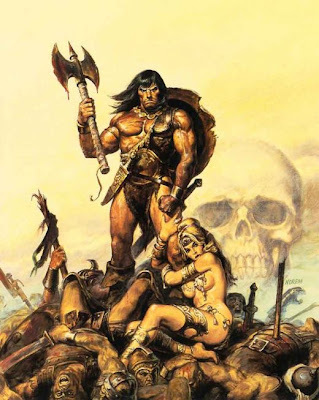 I thought about Conan, by Crom!